This information supports and supplements information included in the UNC-Chapel Hill Design Guidelines-specifically Chapter V: Section 02870 Site Furnishings (Walkway Trash and Recycling Receptacles). Contact Amy Preble at 919-962-5169 for more information on walkway site needs. For information regarding installation, contact Shawn Ellis at 919-201-2832. Place receptacles at the intersections of major pedestrian corridors, plaza areas, and entries to major student areas such as the Student Union and snack bars. 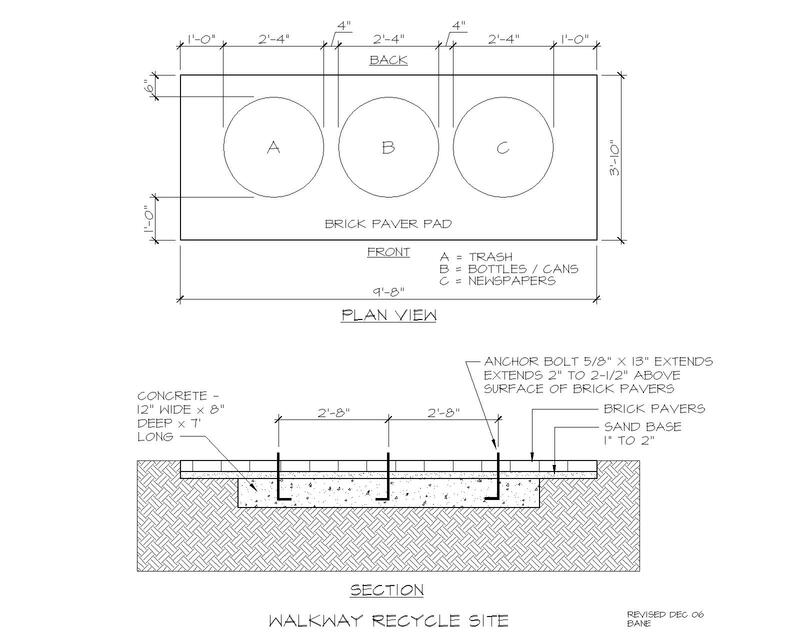 Coordinate placement of “walkway” recycling receptacles with the Office of Waste Reduction and Recycling and the Grounds Department to ensure that the site can be serviced adequately. All containers shall be located on an accessible path of travel per the ADA and State Building Code. Recycling sites must have three containers. One for trash, one for bottles/cans, and one for newspapers. They must be located adjacent to one another as pictured. They should be placed with the trash container closest to the area highest in traffic. The bottle/can bin should be the middle bin and the newspaper bin should be next. The containers should be level, firmly secured to the ground contiguous to walks, and on a brick-surfaced area extending outward from the walk. 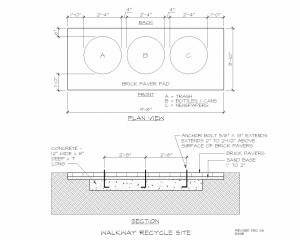 Walkway sites are to be placed on brick pads. Dimensions: The pad area for three containers side-by-side is approximately 9’8″ in length and 3’10” in width. Containers are centered on the pad, 2’8″ apart on center. The containers should be installed in this order from left to right: Trash, Bottles/Cans, Newspapers. Locations of walkway sites and detailed drawings must be shown on the plans. 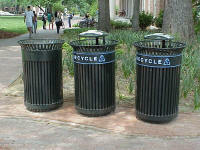 See the Waste Handling Containers & Equipment page. Containers purchased outside of a capital project – contact OWRR to coordinate installation. Installation requires coordination with the following shops: Grounds, Mason, Carpentry, OWRR. The Waste Handling Vehicles page gives complete dimensions for all of the vehicles used to service outdoor (and indoor) sites. The Gator is used to transport materials from these sites to outdoor recycling cart sites. The information on this page can be found in the UNC Design Guidelines, Chapter III. University Planning Standards, Section A. Site Design, 22. Walkway Trash and Recycling Containers; and Chapter V. Technical Design and Performance Standards, B. Division 2 – Site Work (Spec 02870).